Yet functional families of all races and ethnicities also live around the church, where about 5,000 people come to worship at one or more of the 17 weekly masses. Many are Hispanic or Vietnamese by origin (there is a Sunday mass in Vietnamese). Others are Irish Americans whose ancestors were among the first immigrants to work in the mills; the original St. Patrick’s was built in 1869 to meet their spiritual needs. In 11 years, O’Brien’s unequivocal, evangelical mission has helped unify and expand a trilingual congregation in a community rife with entrenched socioeconomic problems. In that same time, the number of operating Catholic churches in Lawrence has fallen by two-thirds, to three, yet St. Patrick’s programs are full and it consistently operates in the black with an annual budget of $1 million, primarily raised through congregant donations. O’Brien’s success depends on his personality—a blunt, respectful honesty peppered with sardonic humor—and a rewarding mix of services. He led the effort to build a new, beautifully designed $2-million “food shelter,” Cor Unum (“one heart”), that opened in 2006. It combats the reality of urban hunger by serving breakfast and dinner 365 days a year, thanks to hundreds of volunteers. Many children rely on it for their daily meals. O’Brien and his small staff (which includes a full-time paid administrator, plus a Vietnamese and several Hispanic pastors-in-training) are adamantly focused on young people. Eight years ago he offended some parishioners by opening the parish center gym on Sunday nights to anyone over the age of 14 who wanted to play basketball. On a recent Sunday about 150 showed up, many of them regulars—young men in their late teens and twenties considered “the toughest of the tough gangbangers around who have been kicked out of every other place,” according to O’Brien. Despite that bluntness, and what some people may view as a lack of people skills, many have come to enjoy his often irreverent humor. At the grand opening of Cor Unum, for example, Rutenbeck filmed O’Brien showing people around and saying, “The somewhat facetious but true idea was that this is like the Harvard Club of Boston, but with more decent people.” Even O’Brien’s mother worried about how people in Lawrence would respond to his humor, Rutenbeck says: “It’s bracing. 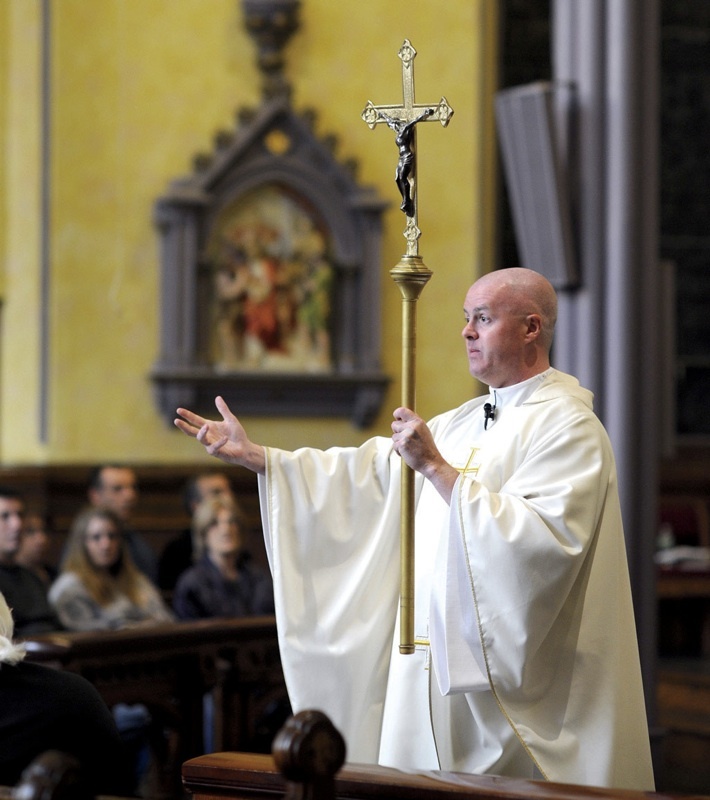 But you have to sort of get it, and get him.” To a group of seminarians curious about how he and the clerics on staff relax and rejuvenate their spirits away from the parish, O’Brien said: “We all have girlfriends.” They were unsure whether to laugh. The gunshots O’Brien heard from the rectory resulted in a double murder. He walked outside that night to find, a block away, two people in their twenties lying dead in the street, each shot in the head. A crowd of adults and children stood around in their pajamas taking in the scene. Once back in New England, O’Brien was a parochial vicar at the affluent, suburban St. Bernard’s parish in Concord, Massachusetts, before working for six years as secretary for pastoral services for Cardinal Bernard Francis Law ’53 at the Boston archdiocese. He was assigned to Lawrence in 2001.